After exploring the upmarket exteriors, the interiors continue to impress us considering how the previous generation Figo was. The Aspire has a touch of premium-ness to its cabin thanks to the extensive use of beige and the new dashboard, which is derived from its elder siblings. You must be very familiar with the centre console and steering wheel from the EcoSport and Fiesta. The three-spoke steering as always feels great to hold with those chunky contours and the piano black inserts look good. There are controls for the audio system and Bluetooth telephony. The stalks have been finally swapped for Indian driving style! The indicator, trip meter and dipper controls are on the right while the wiper controls are on the left-hand-side. The three-pod instrument cluster looks small in size and is a bit basic with a tiny MID display but it is quite easy to read. The headlight and fog lamp controls continue to have the European position, which is convenient and also gets the boot release button there. The rearview mirror controls are placed on the A-pillar like the old Figo and Classic that offer electric adjustment and power folding function with a tap downwards. The Figo Aspire gets automatic climate control on the Titanium and Titanium + variants that chills the cabin quite effectively but at higher fan speeds there is a lot of noise coming out from the vents. The SYNC system with AppLink comes on the Titanium + variant that has a 4.2-inch screen. It offers CD, AUX, USB and Bluetooth connectivity with voice-activated handsfree system. It streams music, which sounds good through its 4-speaker audio system but at high volumes the bass tends to get distorted. There is an emergency assist system that activates when the car experiences a collision and automatically calls the emergency responders providing location and vehicle information. The AppLink system currently works with four apps including Glympse, which lets you share your location with contacts, ESPN Cricinfo that keeps you remain updated with scores, MapMyIndia to explore new attractions and Burrp to discover new food destinations. Another interesting new feature which is unheard of in this segment is the MyKey technology available with the SYNC system. This system lets the owners program the key that limits the top speed of the car, music volume, prevents switching TCS off and also ensures the usage of seatbelt by turning off the audio system unless the driver wears the seatbelt. So if you don’t want your car to be mishandled by some other driver then you can programme the key, which offers great peace of mind. The Trend and Titanium variants don’t offer SYNC system and instead come with an innovative MyFord Dock feature. There is a small compartment on the top of the dashboard, where you can mount your phone and charge it with the USB port placed in the same compartment and also the AUX port for music connectivity. This way you can easily access your phone’s navigation system too without fumbling with the device. The quality inside the cabin is good and never does it feel cheap or built to a cost. The doors are heavy and the car has solid build quality. The controls have a tactile feel, the air vents (none at the rear but the AC is a chiller), audio controls, climate control knobs, window switches, etc. feel built to last. There are more than 20 smart storage spaces inside the cabin to make the cabin look neat and tidy. The front door pockets can hold two bottles including a 1.5-litre and a 1.0-litre bottle with still some extra space left for more things. Then there is the sizeable glovebox with a neat pen holder. Just below the audio system there is a convenient place to park your phone that has rubberised material to keep it in place. Between the front seats there is a compartment that gets three cup holders, coin storage and a bin for the rear passengers. The one we liked the most is a secret side compartment, which is only accessible when the driver’s door is open. There are no door pockets for the rear but there are seatback pockets for newspapers and magazines and a parcel shelf at the back with carved out space to keep tissue boxes and similar stuff. There are no grab handles on the Titanium + trim because of six airbags but other variants get it. There are cabin lights for front passengers but missing for the rear. Unlike the Fiesta, which is an outright handler, the Aspire seems to have sacrificed some of the corner-carving skills in favor of a comfortable ride. We tested the Figo Aspire on the splendid highways around Udaipur, which means that we are yet to sample the ride quality on the broken tarmac. However, the Aspire dismissed most of the small speed humps and slightly rough patches of road with quite an aplomb. The car is adept at gliding over most of the irregularities and our guess is that only the biggest of the craters would unsettle this car’s composure. High speed stability is pretty fantastic, especially when you remind yourself that we are talking about a budget-end sedan here. The steering, which is an Electric Power Steering (EPS) unit, isn’t light and offers at least some feedback. However, it doesn’t weigh up well with speed and the performance-enthusiast might be left slightly disappointed here. The top-of-the-line Titanium variant we drove comes with 14-inch rims that are shod with 145/65 rubber. Grip levels are decent and it is particularly easy to push this car hard into a corner. However, like we said, the Aspire is not as sure-footed as the Fiesta, which means that the slightly soft-sprung suspension doesn’t inspire enough confidence for mid-corner corrections. The Figo Aspire gets ventilated disc brakes at front and drum brakes at the rear. Braking is pretty strong and ABS ensures that the car stops in a straight line. The Ford Figo Aspire as expected comes loaded with all the possible gadgets that one might expect from a car in this category and then some. You obviously get Bluetooth telephony, an integrated audio infotainment system with phone controls and steering mounted audio controls. You also get a height adjustable steering wheel and driver’s seat along with electronically adjustable outside rear view mirrors with an electric folding option. Ford has also taken an interesting approach to a smartphone mounting dock and integrated it well into the central dashboard architecture. You also get what Ford calls a MyKey which is essentially is like a central control over system settings like the speed limiter, seatbelt reminder and the infotainment volume limiter. The Ford Figo Aspire also comes with an automatic climate control and Ford’s SYNC applink that integrates your smart phone or tablet with the infotainment system. 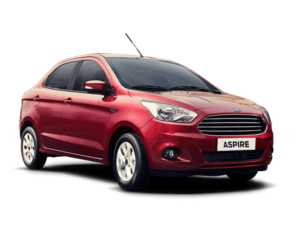 What really does impress us the most though are the safety features that the Ford Figo Aspire comes with. All versions of the Aspire come standard with ABS and two airbags. The top of the line Aspire on the other hand comes with a staggering six airbags which is a first for a car in this segment. The Figo also comes with additional features like hill start control, which too is a first in its class. Lot of thought has gone into development of the Figo Aspire; it might not excel at a specific thing, but is a superb overall package. It looks decent, offers plenty of cabin space, scores REALLY high on safety, beats the competition on performance and has a decent ride and handling package. It does miss out on few features, but I don’t mind missing out if Ford manages to price this competitively. The price then becomes an important factor in deciding the fate of this product. Ford is expected to launch the car and start deliveries in the next three to four weeks and if you are looking at buying a compact sedan or any car under Rs 9 lakh, it makes sense to wait for a month to check this out.